On Friday, I stopped working at 12pm. Kerstin, Angy and I took the opportunity to see something special in the afternoon. 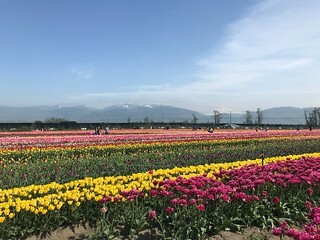 We went to the Abbotsford Tulip Festival. Located in the Fraser Valley, visitors get the chance to see a big field of tulips. Like, a really big field of tulips. We were lucky, because the flowers were in high bloom (and still are). Everywhere I looked, it was colourful. Words can’t describe the beauty of it. Fun fact: tulips are my favourite flowers, so being there was more than just super duper exciting for me. In the evening, we went for dinner at 131 Water. After finishing a delicious meal, it was time to play some games. UNO and Rummikub were fun to play and everyone won at least once or twice. Saturday, 1pm. It was time for our INTERNeX event: Dutchie for a Day. We started with delicious and typical Dutch food at De Dutch Robson. Some enjoyed pannenkoeken (pancakes), others tosti’s or uitsmijters. Then, it was time to be active. Like real Dutch people, we went biking. 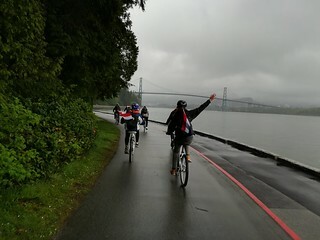 And where can you do this better than around the Sea Wall at Stanley Park? It was a bit rainy, but that made the event even more authentic. And of course, we tested the knowledge of our candidates about the Netherlands. At the end, team Batman won with 12 correct answers out of 20. Congratulations guys! In the evening, we met up with some of you to go out. First, we all went to Bourbon in Gastown for some drinks, to play giant Jenga and to dance. Afterwards, we went to the Republic Night Club at Granville Street. But not by foot. Not by bus. Not by sky train. No, we decided to use a Limo! What a fun and cheap way to get from A to B. At 3am on Sunday, we all went home. This time with a taxi. And Sunday was actually a day of recovery from the night before. My bed was my best friend until 2pm. But I didn’t want to waste a day inside, so I took a shower and went with Kerstin to Metropolis to do some shopping. And I was successful: 2 new T-shirts and cozy short pants to sleep in. I hope you all had a great weekend, too (even though you ‘only’ had 2 days) and I’m looking forward to see you all at our PuB NiGHT at the Beaver on Wednesday! After work on Friday, there is no better way to celebrate the beginning of the weekend than with a good dance at a club. For me, this meant line dancing at the Yale Saloon in downtown. Every Friday, the club has Cowgirl Friday, which means free entry for women until 11pm. Additionally to that, there is line dancing from 8pm until 11pm. It was my first time doing line dancing, but I am already considering buying some cowboy shoes. 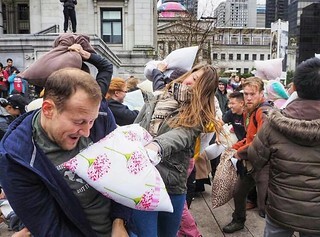 Happy International Pillow Fight Day! On Saturday, we all gathered secretly in front of the Vancouver Art Gallery, our pillows ready to be used. At 3pm sharp, the flash mob started. A few hits on my back, a few on my head, a few pillows into my side. People showed no mercy. OK, they did, since no one was harmed seriously and fluffy PILLOWS were used. After 20 fun, exciting and exhausting minutes, it was over again. So, what to do to keep the level of happiness? Of course, bowling! We went to the Commodore Bowling & Billiards and played for an hour. The two teams were boys vs. girls and luckily, both teams won once. Since all this playing is tiring and makes people hungry, we first enjoyed a coffee and later tasty sushi. With a full belly and a little headache (maybe the pillow fight did affect me more than I expected) I went to bed happily. 11am, I wake up after almost 12 hours of sleep. Wow, I think I really needed that. Best thing right after I woke up: my roommate brought me coffee to bed and pancakes were waiting for me to be eaten. Yep, I could get used to that. 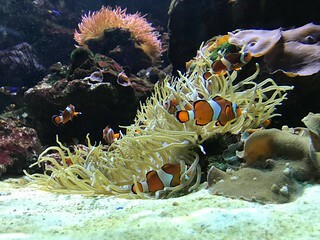 In the afternoon, we headed to the Vancouver Aquarium. We observed cute otters, were fascinated by jelly fishes, listened to the vocals of the sea lions and saw a 4D movie about sharks. Three hours rushed by extremely fast! Hopefully, you all had a great weekend, too! See you on Wednesday at PuB NiGHT at the Portside Pub! Yesterday we went to the Museum of Vancouver. It was great to explore the museum together with you. Thank you for coming! The Museum of Vancouver is a museum about the history of Vancouver, located in Kitsilano. It is normally $18 (or $15 for students) admission. However, on Thursdays it is paid by donation, so you can choose how much you pay. Everybody immediately got their spare change out of their wallets after they heard that people sometimes only pay $1. Apparently, we are all changing a bit into Canadians ourselves, because all of us kept apologizing for giving so many small coins. Then our journey through time began. We started off at the neon age of Vancouver. There were several cool neon signs on display, which used to be hanging in the famous streets of Vancouver. I could really imagine it in Vancouver, as I can still see some neon while walking around in Vancouver. After that we visited the “city before the city”, which we interpreted as the city before Vancouver. Here a few people of us got to meet the “Vancouverite”. I have seen the word quite often, but I was never sure if it is just somebody who lives in Vancouver or somebody who really likes Vancouver. After a bit research, I finally got the answer. A Vancouverite is somebody who was born in Vancouver or who is a resident of Vancouver. So now we know and can move on again. Now it was finally time to go to the Rock ‘n Roll scene of Vancouver. In this room they displayed a seating of a snackbar. It immediately gave me the feeling that we were in the serie Riverdale, which also has been filmed in Vancouver. I also tried out the jukebox, but unfortunately it didn’t work anymore, so we weren’t able to listen to the classic hits of this great time. We ended off with the hippies. After seeing all these protest signs, we felt like protesting, which we all ended up doing too. I hope you all had a great time and see you on our next PuB NiGHT! Only a few more hours to go and then our weekend starts! If you do not have any plans for the weekend yet and want to do something then check out one of these activities. INTERNeX was first planning on going for a hike at Lighthouse Park. Unfortunately, it will be rainy tomorrow all day long. Therefore, we decided to go to FlyOver Canada instead. FlyOver Canada is a flight simulation. It will take you high into the sky and show you the beautiful scenery of Canada from above. The whole activity takes about 25 minutes. We will be meeting at the entrance of FlyOver Canada at 3 PM. In the evening you can get some drinks in a pub while watching the last Canucks game or you can get tickets to see the players in real life. The game will start at 7 PM and will be against Edmonton Oilers. So let’s cheer for our favourite team one last time! If you are a big Harry Potter fan and love classical music, then check out the Harry Potter Film Concert Series! During the show you will watch Harry Potter and the Chamber of Secrets supported with music by The Vancouver Symphony Orchestra. You will experience the movie in a totally different way. Till the 28th of April the Capture Photography Festival is taking over Vancouver. The Capture Photography is an annual festival celebrated in and around Vancouver. This festival is used to celebrate and promote photography and lens-based art. During the festival there will be exhibitions, public art and educational activities throughout Vancouver. Have a great weekend and see you at FlyOver Canada! 2014 was gone … and 2015 was packed with a lot of great trips and events! The last four weeks of 2015 have been starting and that means it’s time for us to start reviewing the highlights of this year. Within the next four weeks we will weekly publish a ‘highlights of the year review’ in which we’ll summarize the four quarters of 2015 full of awesome activities. I’m sure it’ll be quite a lot of fun remembering all the crazy and awesome trips, events and PUB NiGHTS we had planned and experienced with people from all around the world. So DON’T MISS this time journey through 2015. Among others we checked out several restaurants and pubs such as The ROXY Burger, Star Wings & Ribs, the Noodlebox and The Famous Warehouse. The very first day in January the Vancouver Canucks started in their second half of the season 2014 / 2015. The excitement was obvious all over town! As you probably know, hockey is huge here in Canada. Besides of going to several good known restaurants and pubs such as The Old Spaghetti Factory, The Morrissey and The Black Frog we also didn’t miss the Super Bowl. It’s THE BIGGEST sport event in the world. This year the Seattle Seahawks played against the New England Patriots in Arizona and therefore we met up to watch the game together. The American Football Conference (AFC) champion New England Patriots defeated the National Football Conference (NFC) champion Seattle Seahawks, 28–24, to earn their fourth Super Bowl title. We actually cheered for the Seahawks since Seattle is so close to Vancouver and the folks there are so similar to those here in Vancouver. Friendly, openminded, helpful, honest, interested, cosmopolitan, … Anyways the win was pretty close. As the cherry blossoms and many other flowers filled our streets, parks, and yards with pink confetti, March arrived and by association spring. And as always there was a lot going on in beautiful Vancouver. Vancouver hosted the 37th Vancouver International Wine Festival and an International Dance Festival. Our INTERNeX group regularly met up for our weekly PUB NiGHTS. We decided to have a look what other pubs have plenty to offer. So we took our new arrivals to pubs like the Manchester Public Eatery, The Bismark, The Doolin’s and the Yaletown Brewing. Of course we also had to show them Blarney Stone. Belated Happy Thanksgiving to everyone! Last Friday we had a Thanksgiving Dinner at the revolving restaurant on Robson Street. post but I would like to tell you more about this awesome night we passed above Vancouver’s roofs. Especially the view was just gorgeous. During the Dinner the restaurant revolved, as its name already implies. So we had a 360-degree-view on several “sights” such as the Lions Gate Bridge, North Vancouver, the Pacific and Stanley Park. Regarding this holiday we had a 3-course-menu with traditional roasted turkey and stuffing. After the Dinner some us went to Steamworks to have some drinks. As I also mentioned in my last blog post I went to Victoria this passed weekend. We had an amazing time there and a trip from Vancouver to Victoria is definitely worth it! Compared to Vancouver, Victoria is more like a village than a city but that’s why it’s so beautiful. In my opinion our whale watching tour was the best part about the trip. Yes right, we were whale watching and it was just awesome! Moreover it was not that expensive than we would have expected. Luckily we saw many whales and a lot of seals. Even three of the whales dived under our boat. It was an unlikely feeling because actually the boat must observe a certain safety distance. Probably this safety distance is more for the whales than for the humans but however I had a bad feeling in this moment. At the beginning I thought it’s a kind of boring, that we wouldn’t see any whales and that it wouldn’t be worth it but instead I’m so glad we did it. We also went to Fisherman’s Wharf to feed the seals there. They are so cute! You can buy some fish for them at the small stalls and they aren’t shy quite the contrary they steal the fish out of your hands. ancouver, at least for a daytrip. Tonight our Pub Night is at Moose’s Down Under. It’s Trivia Night! Yesterday evening was an amazing night for all of us and especially for me. I have never seen an ice hockey game before and I guess for most of you it was also the very first time you saw an ice hockey game here in North America. That’s actually a chance you don’t get that often. In addition to that I got to know all of you and I had the chance to talk to some of you. I hope we will enjoy a lot more events and trips together. But now back to the game last night. Unfortunately the Canucks lost their second pre-season game without a goal although they had much more chances to shoot a goal than the Sharks. 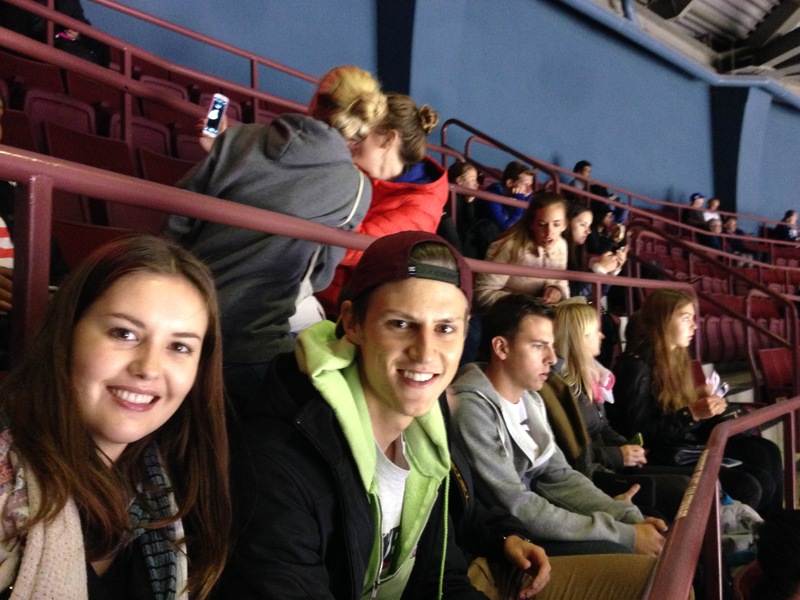 However I would say we could be happy to join at least one match of the Vancouver Canucks during our time here. It was just such an amazing feeling to be part of it (although I didn’t get and still don’t get the rules). What I can tell you, but only because I did some research is that, there is an overtime period, which takes five minutes with 3-on-3 hockey players. If the score is tied after this overtime, it results in a shootout. But as we all know the score wasn’t tied so we couldn’t see a shootout. But that doesn’t matter because there were so many other things to see and to experience. For me it was a gorgeous start to my time here in Vancouver. I hope they will play better during the regular season.